The WeatherTech SmartCharge Battery Charger is simply the best charger made for the long term maintenance of your vehicle’s battery. Exclusively designed for keeping your battery in prime condition while vehicle is not in use. WeatherTech® Battery Charger monitors your battery’s condition and only when necessary, uses a 4-Step charging method to keep your battery in tip-top shape! This is an intelligent battery charger unlike others that “cook” or boil batteries unless you physically shut them off. It constantly monitors your battery’s power levels and will turn on or off to maintain a freshly charged battery. Our battery charger also includes a built-in surge protector because we believe you should protect your expensive vehicle electronics just as you would your computer, television and other appliances. Installation is easy and safe as well! Our technology will not allow current to flow until the proper connection is established. We encourage you to read the user manual included in the box to properly enjoy all the features it has to offer. Use it with your car, truck, van, motorcycle, lawn tractor, snowmobile, ATV, boat and more! 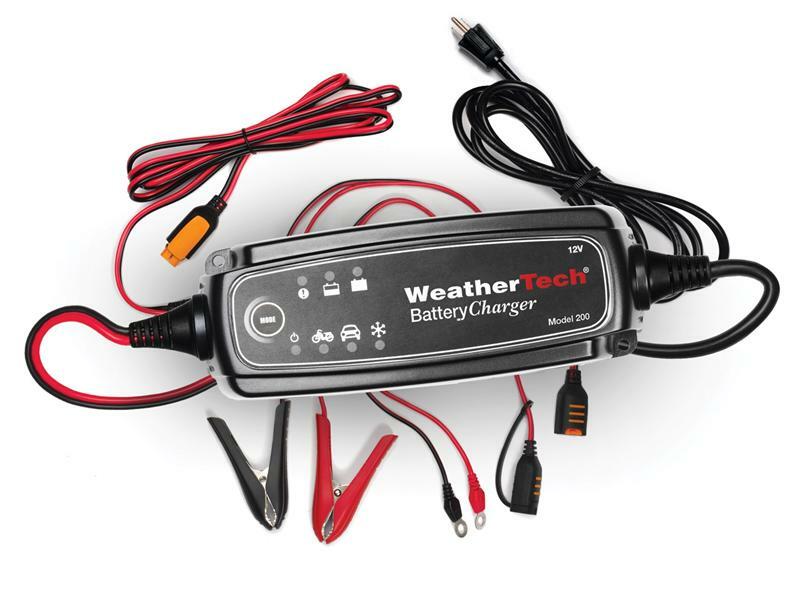 WeatherTech Battery Charger comes with a 5 year limited warranty. For all types of 12V lead-acid batteries.